Unfortunately the website of luftdaten.info is in German, but they are working on an english translation. I will provide this translation here as a courtesy. This sensor is inteded to hang outside your house and continously measure the air quality there. It will send it’s data to the map of luftdaten.info. 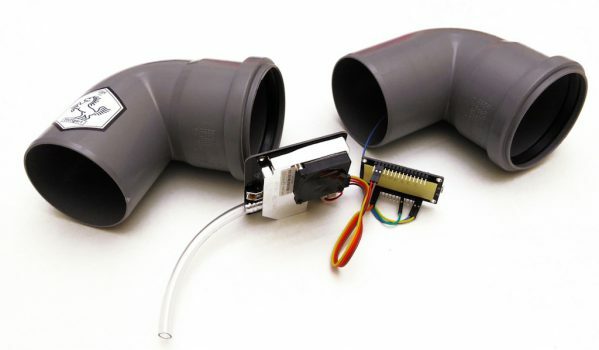 – Marley Silent HT Bogen or other housing, but it should not make a chimney effect. If you want a diffrent case you find instructions here. (The links on this website will direct you to AliExpress in China. This is where you will get the items very cheaply but you will have to wait about 6 weeks for delivery. If you order one piece you stay below the 22 Euros import tax. First put in the right firmware then build the sensor. 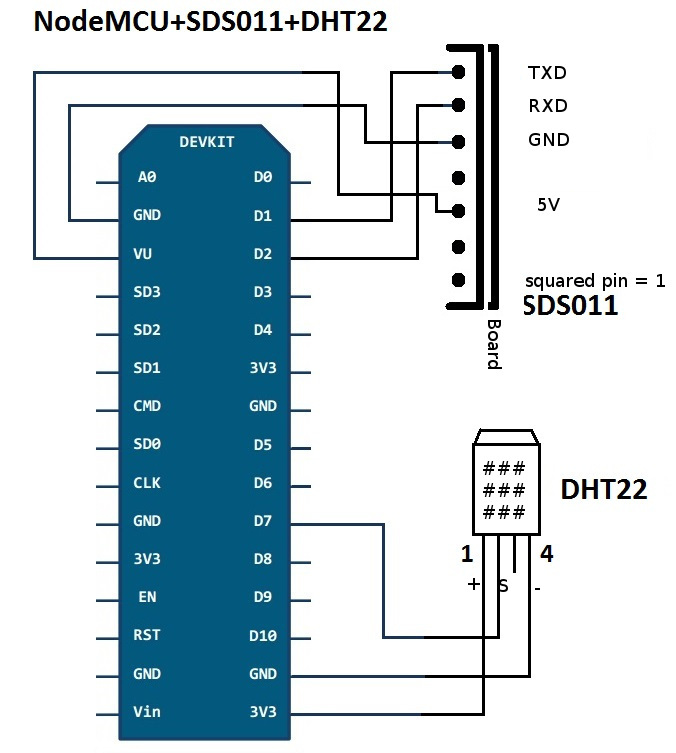 To communicate with the ESP8266, it needs usb2serial driving. The chipset for NocdeMCUs is usually CH341: driver’s side (Chinese). Caution: For copying to the NodeMCU, use a USB cable of no more than 1m in length. The firmware is updated regulary to add new functions, like new languages. There is a little box inside the firmware that says „auto updates“ you should leave this box ticked if you want to keep your sensor firmware current. For example, the appropriate port is obtained by connecting the NodeMCU to the desired port and then starting the Arduino IDE. Under, Tools -> Port ‚the available port can be seen, usually the port with the NodeMCU is quite easy to recognize. Then close the IDE again because otherwise this port is blocked. If problems occur, try to execute the above command as root. Then, in the path, ~ / ‚must be replaced by the home directory. The sensor attempts to connect to the configured WLAN access point. If this does not work, the sensor opens an access point with the name „Feinstaubsensor ID“, where ID is the chip ID (some number). Please note: If the configuration of the sensor has worked, this page is no longer available. The wifi hot spot will be closed, this is how you notice that it worked. For Particle Matter sensors nothing else needs to be changed. In order for the sensor to become a part of the network, we need some information. If possible an image, where the sensor hangs – will not be published. Usually the people from Luftdaten info will put your sensor on a map within a couple of days. See the entry on my blog about this.